Juan van der Hamen y Leon was the son of a Flemish painter of still-life, Jan van der Hamen, and a Spanish mother. 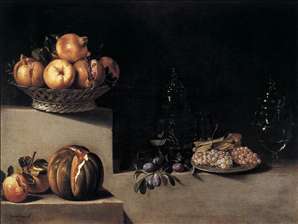 He was a major painter of bodegon still-life and genre in a style still markedly Flemish. 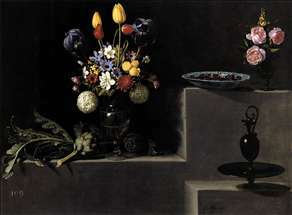 He was also the most important still-life painter at court in the early reign of Philip IV and a pioneer in the field of flower painting. 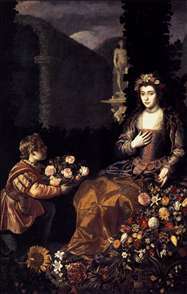 Van der Hamen probably began painting floral arrangements in response to the flower pieces of Flemish artists, such as Jan "Velvet" Brueghel, who were regarded as exemplary masters in the field and whose works were much sought after in Spain. His Cook (c.1630, Amsterdam, Rijksmuseum) is curiously like an Aertsen or a Beuckelaer, though he presumably never saw one. Other works are in Brussels, Cleveland, Ohio, Houston, Texas, Madrid, Washington and Williamstown, Mass. See more details about "Offering to Flora"
See more details about "Still Life with Flowers and a Dog"
See more details about "Still Life with a Puppy"
See more details about "Still Life with Flowers, Artichokes, Cherries and Glassware"
See more details about "Still-Life with Fruit and Glassware"